A while back it seemed destined that Samsung and Qualcomm would split after the Snapdragon 810 was rumored to have overheating issues. There have been multiple leaks supporting Samsung’s shift to using their in-house Exynos 7420 processor, but today it seems all but official. The Galaxy S6 running the Exynos 7420 processor has appeared on the AnTuTu Benchmark, and it crushed it. The Galaxy S6 has previously showed up on Geekbench, putting up impressive scores against its top competitor, the Snapdragon 810. Not only did the octa-core Exynos 7420 chipset clocked at 2.1 GHz dominate its predecessor (Exynos 5433), but it topped over 60,000 on AnTuTu. It reached a score of 60,978 to be exact. 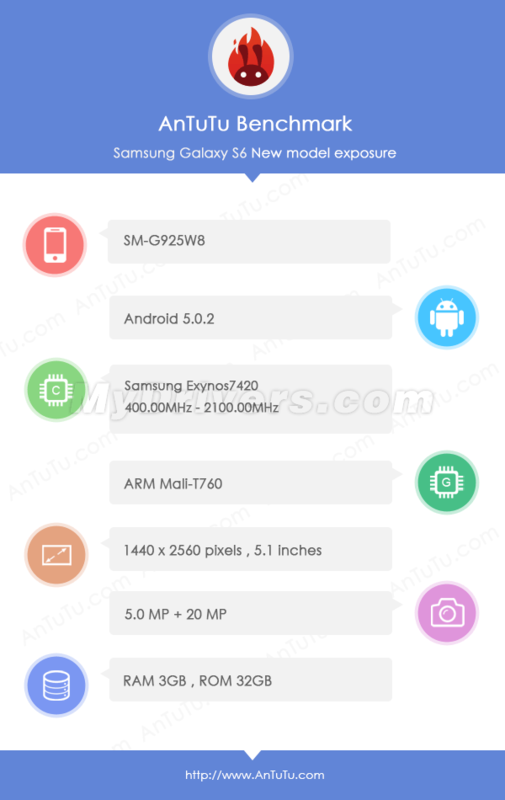 Not only did we get the treat of seeing what power the Galaxy S6 and Exynos 7420 tandem is capable of, but we get the most complete spec list so far. The Galaxy S6 that was tested is running the latest version of Android 5.0.2, sporting 3 GB of RAM, and a 20 megapixel rear-facing camera accompanied by a 5 megapixel front-facing camera. The newest Samsung device is definitely looking up to be of flagship quality, even more so that the Galaxy S6 will be the first Galaxy S device to sport 3 GB of RAM and a 5.1 inch QHD display. All of these will either be confirmed or denied come March 1st at MWC, but until then, this is our best look so far at the Galaxy S6. Samsung Galaxy S6 and HTC One M9 comparison: Who will come out on top?